Welcome to “Stories We Live”, a place to explore the myriad uses of personal story and narrative to promote healing and conversation. Included below are personal stories, reflective narrative accounts of the experience of telling and working with personal story, and thoughtful observations and explanations of how personal stories are used to help create occasions of healing for self and others. We welcome your reflections on what you find here. We are eager to hear how these and other stories have evoked memories or hidden stories within you or a listener. We would also appreciate your contributions of a personal story or experience working with story in your healing work, whether it is in a formal healing setting or an informal interaction. 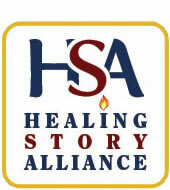 We encourage you to use these stories and commentaries as examples to help you create and use your own personal stories and/or to develop approaches to using personal story in your healing work. However, we ask that these stories not be performed, recorded or reused for any commercial purpose without specific permission from HSA and the author. Those interested in submitting reflections, stories or experience with stories to “Stories of Self and Community” are encouraged to send their copy to Allison Cox.